Last week spend lots of time playing with my nieces, so had to hurry to catch up and make done what I promised would be finished sooooonest possible! 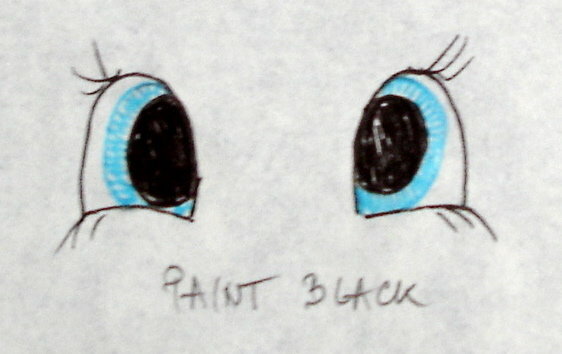 For now have made this little tutorial on how to paint eyes for Fairy doll (or any other doll of your choice). Tried to make nice photos, to show you how it looks when painting is done on actual doll and yarn, but it ended complete disaster. Me and photo taking – zero points! Will keep on trying to take nice photographs every time I will paint the eyes, hoping soon I will be able to show you how it is made, or I make it. For now have few bad photos and step by step drawing with instructions what is needed to be done at each stage in order to make the eyes. First of all, as I mentioned in one of my earlier posts, you will need paint for textile or fabric. I used Marabu paints and 3/0 brush (that I found in the store when buying the paints – was the thinnest one I could find at that time). Here is the photo of the paints used, for those that are not familiar with what to look for. Once you have all materials ready draw the eyes you would like your doll to have. Draw it on a piece of paper you will keep a side and use as reminder, guidance while drawing on dolls head. 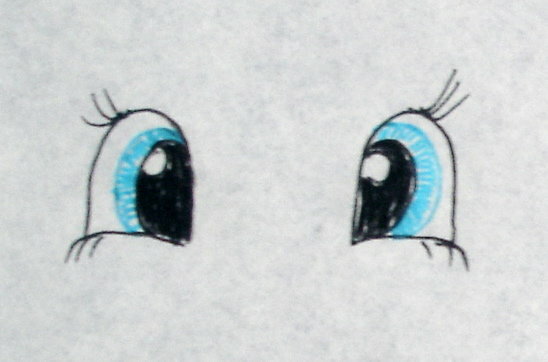 You can look for inspiration by reading few children books, watching cartoons… I have made few drawings on how eyes can look. You can use these as well. 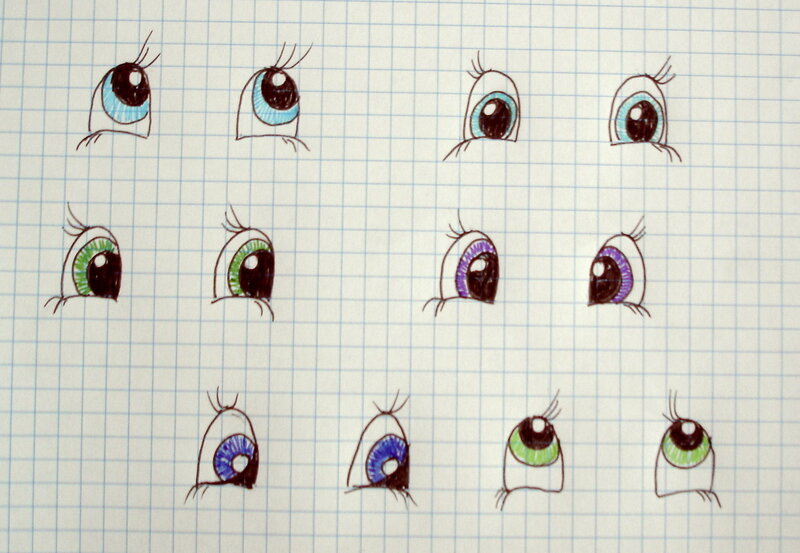 These are, of’course, type of eyes I like to use. If you can see, I draw them on square paper, so you can see how many stitches to leave between, and how big to make them. For fairy dolls, I tried to make them 3 rows high and 2-2 1/5 stitches wide, trying to keep them separated by leaving 3 stitches in between. Drawing this I made mistake outlining the iris. 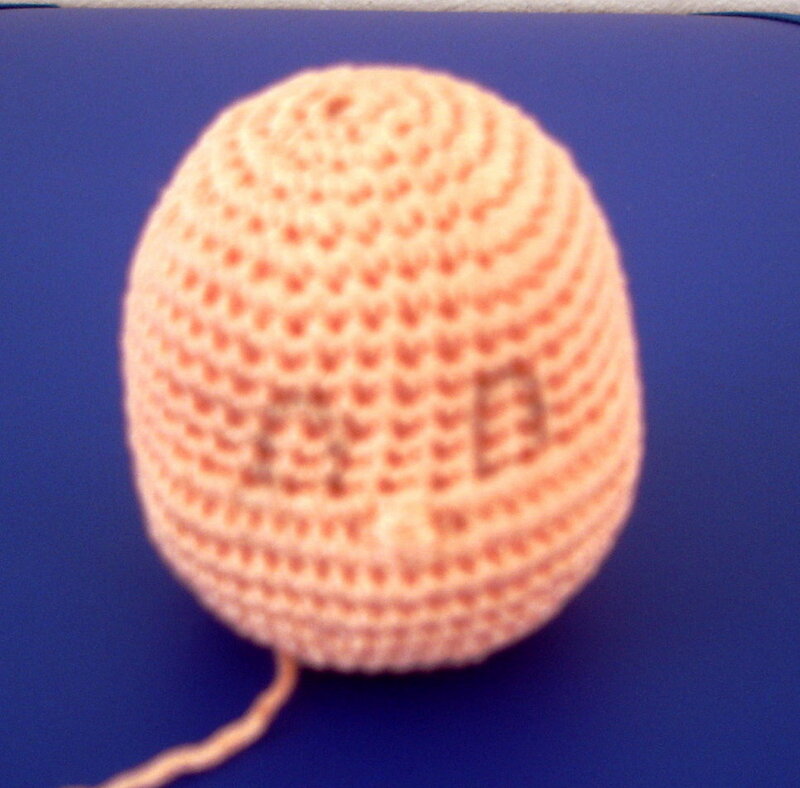 When painting on crocheted head it is very hard to make an outline, specially inside the eye, so drop that line. Color the iris with desired color, but do not bother to try to outline it with black, as it might end up as disaster. Once you have decided about eye design you will use on doll, and after you made a little drawing to give you a hand while painting, take the doll’s head. 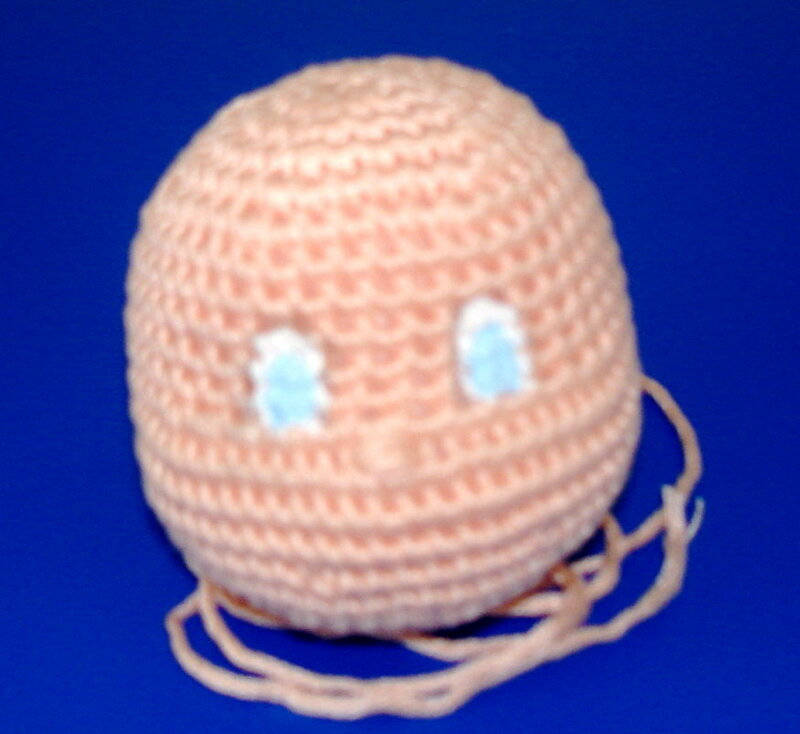 On fairy doll is easy to paint the eyes, because the whole front face designed while crocheting the head. On the photo below you can see how I pinned eye’s edges and then made an outline with the pencil. 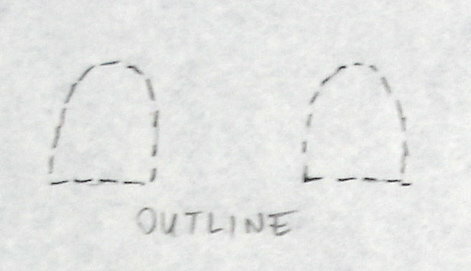 Once you have the outline ready, and it looks fine to you, you can start with painting. First you have to paint the base, and it is done with white. Make sure to paint inside the stitches as well. If you will work with tiny brush, adding little bit of paint every time, you will be able to stick the brush in between stitches in order to cover all the area. While painting, important is, to be patient. Take your time. Painting the eyes can’t be done in minutes. You will have to wait for the paint to dry before starting with another color. The most important step is deciding what eyes will look like and making the outline on the head. 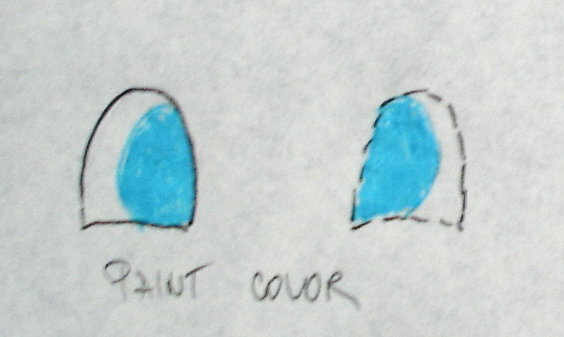 The rest is easy, as all you will do is to follow the drawing and make progress by adding different color at the time. Once you have made the base, pained it in white and once it has dried. You will see it is dry once it is not shiny any more (wet looking). You can double check it by slightly touching the surface to see if it sticks or leaves color on your finger. I let my layers to dry for an hour or more. 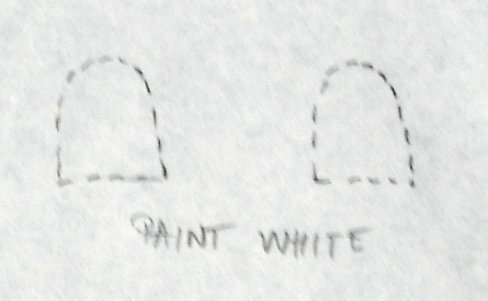 Once the white paint is dry, you can start adding the color. At this point the iris of an eye is to be painted. Choose the color you will use for the eye, look at the drawing you made, check where to apply the color, take little bit of paint at time and paint the iris. Here is the last photo that I have made, and hardly can show the color I applied. That is why I made a drawing of this tutorial I will post the end with step by step repeating the whole process. After the color dries, using black and all that is black is done. Using black color you will paint the middle of the eye, with soft brush strokes try to make the outline, all around the eye, make few eyelashes on the upper side, and if you like you can ad one of two of them on the lower eye part as well. After this part, with adding black is done, leave the doll to dry very well. The last touch is to add sparks to give the eye, kind of alive look. 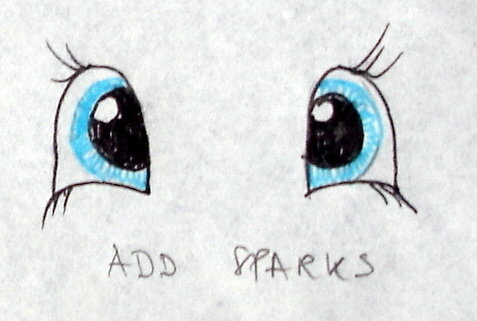 You will see that the spark changes the way eyes look completely. After adding the sparks. Making eyes is done! Let it dry completely! Here is the short tutorial in drawings I have made for you (before I make decent photo tutorial on how I am painting the eyes)! I hope this little tutorial did help some of you. I am here for any assistance you might need. Feel free to ask. Wishing you happy Monday and rest of the week! Hey, the image on top of this website submit is reloading a little strange for me personally? I used mailing an e-mail but it bounced rear. You are the second person I’ve heard say that about a book or story. I just started selling my dolls on Etsy. I like t he story idea but haven’t done that.